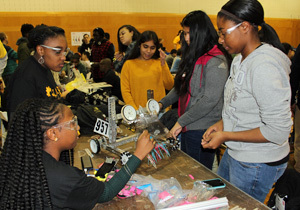 Alexsis Davis is a member of Gear Girls, an all-minority girls’ robotics team throughout the school year from George Carver High School in Philadelphia. A documentary film is being made about the team, which will examine their journey, their struggles, and discover what makes them successful. 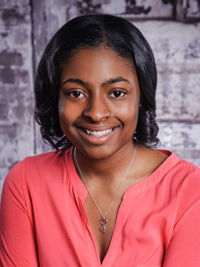 Alexsis has been part of the team since 2014, and she is a studying to be a mechanical and electrical engineer, although she is undecided which route she will pursue. I was first interested in STEM as a child. I loved getting toys that I could build and make move. I remember one time, I had a wind-up toy that I took apart with my father’s tools. I wanted to see how the toy worked. I would do that to multiple things around the house. My strengths in school were math and science, so my parents started to enrol me in STEM summer camps. I started going to summer camps for STEM just after 6th grade. I tried computer programming and engineering camps. I remember enjoying the camps where I could see my creations and the result of my work. I think that is why I enjoy robotics so much. There are an infinite amount of problems that could be solved with robotics. 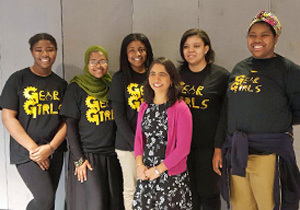 Gear Girls is an all-female robotics team at George Washington Carver High School for Engineering and Science. Our team does the FIRST Tech Challenge (FTC), which is a national robotics competition. It was started in 2014 by our engineering teacher as a way of increasing the number of girls involved in robotics. He started out with five girls in 2014. I am one of the original five girls and was with the team for three years until I graduated. On the team each of the girls had certain areas that they knew about when it came to the robot, and the five of us together could cover every section of its production. I knew how to do the mechanical and the electrical part. 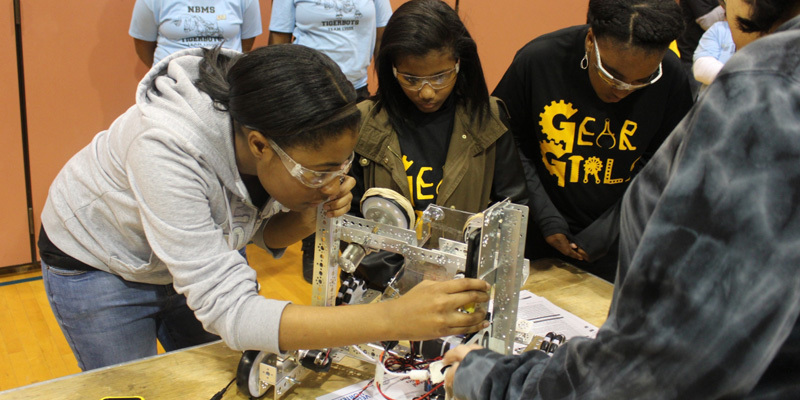 Gear Girls has made competition robots for FTC, which has events throughout the year. Gear Girls made it second in the city of Philadelphia teams, which was the regional level. Some of our members were on another team that created underwater robots for SeaPerch, another competition . That team made it to the national level in the SeaPerch competition. Robotics is an important technology for future generations because our world is slowly becoming automated. Some human jobs will be taken over by robots, and companies will hire those who can fix the robots and automated systems. 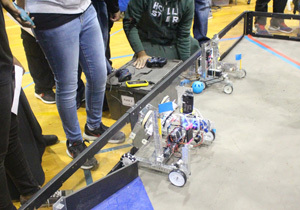 The skills learned in robotics can also be applied to many engineering disciplines. Being part of Gear Girls gives me a sense of pride because I know I am making a difference. In my college chemistry class our lectures were more than one hundred and fifty people. Only fourteen of the class were women. As I continue throughout my schooling I am finding more and more women in the STEM fields. However, BAME women in STEM fields are still the minority. My advice to other BAME girls who are interested in STEM is to never give up, to push through when others say you cannot. I have had some many people in my life tell me I am making a mistake, or I should do something different. I have also been put down by my male counterparts. They tell me to do something more “appropriate” for someone of my ethnicity. I am currently going for an engineering degree, and even at the college level I still hear that I should not be here. However, I show them my grades. I show them what I have done. My other advice is to find your support group. My family and extended family never put me down. They never tried to stop me from pursuing what they saw I wanted. They sent me to overnight camps across the country from them alone because they knew that it would be a wonderful thing for me. Even my friends support me. I find the people in my college that will support me, no matter what their gender. I have friends who will study with me when I need help, who will be there when I fail and who encourage me when I try. Finding that support group is important for every minority female trying to get into a STEM field. The Gear Girls documentary is being made just after the movie Hidden Figures was made. The movie shows the struggle of minority women who have jobs in NASA sixty years ago. Our documentary showcases the stories of the girls on the team. As minorities in the city of Philadelphia, we already have certain standards and oppressions placed on us. To show girls in a position where they can succeed is important in bringing awareness to the lack of diversity in STEM fields. The documentary is in production right now. We are all currently freshman in college, so we are focusing on our academics. I’m looking forward to watching the completed film and using it to help other girls realise they can excel in engineering and robotics too.